In Odessa, Ukraine, Daria, a whip-smart engineer, spends her days underemployed as a secretary a job she was lucky to get in this rotten economy. She spends her evenings moonlighting as an interpreter at an agency that matches lonely American men with beautiful-but-broke Ukrainian women. She spends her nights wondering if there is more. When an American client offers marriage and a one-way ticket out of poverty, Daria jumps at the chance. She soon learns there's a reason that her husband couldn't find a wife in America, and that the grass isn't always greener on the other side of the world. 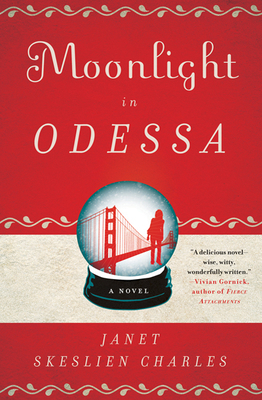 The perfect book for anyone who's ever been stuck in a dead-end job or relationship, "Moonlight in Odessa" is an exploration of language, culture, and the difficult choices we make in the pursuit of love and stability. Originally from Montana, Janet Skeslien Charles lives in Paris, where she leads writing workshops at the Left Bank bookshop Shakespeare & Company. Moonlight in Odessa was inspired by her two years as a Soros Fellow in Odessa. This is her debut novel.